Make Your Little One's Bath Time Fun - and Safe! We bring you all the advice and information you need to choose a baby bath seat - the perfect accessory for bathing your baby boy or girl safely and hygienically at home. Read about the various types of bath seats and supports, the benefits of owning one and how to use them correctly. We also give you the low down on a range of other accessories for bath time including baby baths, bath toys and tummy tubs. A Baby Bath Seat Guarantees a Splashing Time! A bath seat is a great accessory for ensuring your baby’s bath time is a fun and safe experience for child and parent. Finding the best seat for your little one is not easy as there are many different brands and styles available these days - so we provide a wealth of help and guidance to help you choose the bath seat that's right for you. A bath seat is a great way for parents to have a splashing time with their little ones at bath time. However it’s important to ensure your baby is monitored at all times and never be left alone in one of these bathing aids. You’ll find bath seats and supports here from many of the top brand names including Safety 1st, Maltex, Ok Baby, Dreambaby, Safetots, Angelcare, OKT Kids, Babies R Us, Disney, Tippitoes, My 1st Years, Mothercare, Mamas & Papas, BBCare, Rotho Babydesign, Dunya and Tega Baby. We also feature a range of other baby bath time products including baby baths and cradles, bath rings, bath mats, Tummy Tubs and some delightful bath toys. Bathing your baby is important for the obvious health and hygiene reasons, but it’s also a great opportunity for bonding and interaction with your child. Bath time can be a time of fun and learning with some of the many bath toys available - but it’s important that your baby is completely safe at all times - that’s where bath seats or supports can play an important role. A bath seat or chair allows your baby to join in a variety of playful activities in an upright position, while remaining safe in the seat’s enclosure - and of course you always be close to hand to make sure you child is safe and not stressed or anxious in any way. We feature all the top brands of seat, including the popular Safety 1st swivel bath seat which lets you turn your baby 360 degrees by using the handy swivelling feature. This lets you reach every part of your baby's body when you are carrying out washing and bathing. A bath seat is not recommended until a baby is around four to six months old and can sit up without being supported. These baby bathers are usually constructed from toughened plastic and are available in a variety of different colours including blue, yellow. white, purple, pink and red. Suction pads are positioned on the base to enable it to grip firmly to the base of your bath. They also feature a support which goes between your baby’s legs and a plastic ring which goes around your baby’s waist. 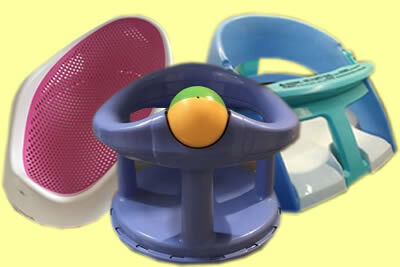 Some seats have toys attached to them to gain the baby’s attention while it is being bathed. If your baby is very young your best option for bath time may be a baby bath support which allows your little one to lie back in comfort while being bathed and they are ideal for newborn babies. A bath support is positioned inside your main bath and allows a baby to lie back in it but not be completely immersed in the bath water. There are many benefits to be gained from buying a bath seat. ring or support for your little boy or girl. Here's just a few to consider. Bath seats and supports are very easy to maintain but parents must remember to clean them regularly to prevent any risk of them getting mouldy. Baby safety and hygiene must be paramount at all times. There are many types of bath seat to choose from, including swivel and folding models, and most are fairly cheap to buy and are often suitable for infants too - we have many of the best prices around for you to compare - starting at around £10, with the top of the range products costing £30 or more. We also feature some ergonomic bath seats and chairs which ensure your little one is sitting in the most comfortable position possible. Newborns and very young babies who are unable to sit upright will need to use a bath support, rather than a seat. These are often made from plastic, but alternatives are made of foam, sponge and towelling with a wire frame are also available and are very comfortable for your baby. It cannot be stressed enough how important it is to ensure a baby or infant is monitored at all times when using a baby bather chair, baby bath support or baby bath - there have been tragic cases in the past where babies have drowned when parents have left their children unattended briefly to take a telephone call or carry out another short task. Reports by the Royal Society for the Prevention of Accidents (ROSPA) of fatalities in the UK alone in the last 25 years make alarming reading. 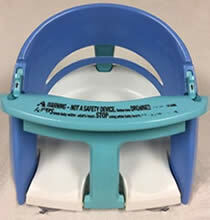 Check out our baby bath seat safety - tips and advice. Some bath seats have a spinning ball or other little toys attached to the front to keep your baby boy or girl occupied while mum or dad get on with the job of getting their little on clean. 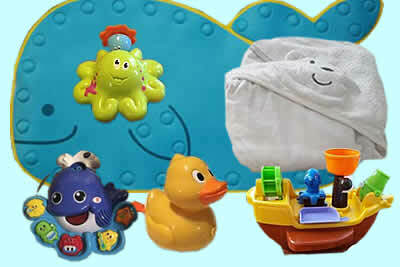 There's also the option to add other plastic bath toys to the water to provide even more fun. The lightweight design of bath tub seats makes it very easy to positon them in a bath take them out again, and the smooth shape makes cleaning very simple. Slip-resistant seats ensure there is not risk of your child sliding out of position. These products are bathing aids, not safety devices - so babies should never be left alone in the bath, not even for a second. Lots of parents get by without buying a bath seat or support, but these handy device are great time savers which make bathing much more comfortable, relaxing and fun for you and your baby. With your baby in a bath seat you can play together, splash about and have fun - while getting back clean at the same time. Bath time supports and seats are great devices for allowing you some quality time with your newborn, baby or infant and we’re confident you’ll find one here which is perfect for your needs - at the best prices around. We suggest you compare several products before making your final decision about which one to buy - full details about each bath seat or other bath-time accessory can be seen by selecting the ‘Shop Now’ buttons in our site store. We feature bath seats from leading UK baby care stores including Baby Curls, Kiddies Kingdom, Argos, Kiddicare, Baby & Co, Amazon, Tesco Direct, JoJo Maman Bebe, eBay, Boots and Mothercare. We also bring you an impressive range of other bath-time products including baby bath tubs, the popular Tummy Tub , which is also known as a bucket bath, washpods and dozens of colourful bath toys to keep your little ones occupied and entertained while you get on with the job of bathing and washing. You'll also find several other handy bath time accessories here including baby bath thermometers, hooded baby towels and changing mats for getting your baby into fresh clothing after bathing.